Oftentimes new bunny owners surrender their pet rabbit to a shelter because BunBun, while utterly adorable, is also amazingly destructive. She’s rounded off the edges on all of the furniture and molding; she’s ripped out the stuffing from the couch; she’s dug the carpet into a frayed mess. 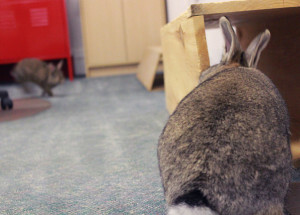 It can be very frustrating to watch your previously nice home turn into your rabbit’s urban warren. Yet, digging, burrowing, and chewing are natural activities for your rabbit. So below are a few tips to reconcile the situation. Using a combination of these tactics will be most effective. My first reaction when my rabbit would start chewing the furniture, rug, or molding was to firmly say, “No!” and clap my hands. While I thought this would help her understand that her behavior was undesirable, I quickly realized that it wasn’t as effective as I’d hoped. Reprimanding the rabbit would simply distract her momentarily. 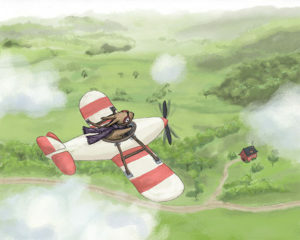 She would either move on to a new activity only to return later, or she would resume the same naughty behavior once she’d decided the noise was gone and all was well again. There did not appear to be an understanding that her behavior caused the clapping and saying “No!”, and that she should discontinue that activity completely. It is not effective to discipline your rabbit after the fact. If you come home to find your bunny resting comfortably and the molding is chewed up, it is not the time to reprimand. She will not understand why you are angry, and it will just stress her out. So while reprimanding your rabbit at the time of the naughty behavior may be slightly effective, it is best to also use the techniques below. Rabbits tend to learn better when they are rewarded for good behavior, rather than when they are disciplined for bad behavior. Determine what your rabbit enjoys most, such as praising, petting, grooming, or small healthy treats. When she chews and digs acceptable items like chew toys, old phonebooks, or her cardboard castle, let her know this is good behavior! This brings us to the next tactic. If your rabbit has a continuous supply of timothy hay to eat, some toys to play with, a grass mat to dig on and a cardboard castle to renovate, she will have less of an inclination to chew your furniture and dig up your carpet. Your rabbit needs to chew and dig on a continual basis. This wears down her teeth and claws, which are always growing. 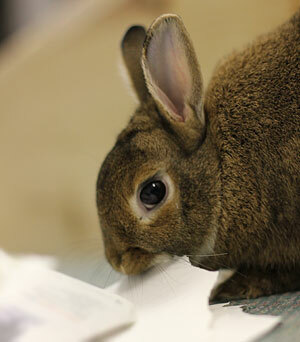 Providing safe items to chew will ensure good dental health for your rabbit. Except in rare cases, you will still need to trim her nails. You cannot declaw a rabbit. Not only is it extremely painful, but rabbits have no pads on their feet and need claws for grip. Even if your bunny is well-behaved, it is best not to tempt her. Keep all wires, important documents, and other cherished belongings out of reach or protected. In terms of protecting your furniture, I’ve read a few articles that suggest applying Tabasco sauce or Ivory soap (specifically the Ivory brand because others may have harmful chemicals). I did not particularly want my furniture covered in soap or Tabasco sauce, so I have not tried this. However, I have tried putting on a special bitter lime spray that was supposed to keep rabbits away from furniture. This was not effective on my rabbit. In fact, she even licked the spray off. So, I use a puppy pen to block off the part of the room that has nice furniture she likes chewing. I keep the rest of my nice furniture in other rooms that she can’t access. For more information, see the Bunny Proofing Your House article. So with a little patience and supervision, some rabbit toys, and a bit of bunny proofing, you are well on your way to creating a harmonious life with your pet rabbit.